The Asian Diet highlights the fact that for 4000 years the Chinese have followed a diet that enables them to maintain a slim physique. However, when they relocate to Western countries – and start eating like us – they gain weight and begin to develop a variety of health problems. For that reason the author, Jason Bussell, recommends looking to Asian cultures for the best advice on what to eat. Jason Bussell informs us that the average Chinese person consumes 25-40 percent more calories than the average American. He explains that they don’t gain weight because they consume calories from natural sources. These foods provide a steady supply of energy, satisfy your appetite and assist with the elimination of wastes. However, you don’t have to eat Chinese food or even Asian cuisine every day to follow this plan. The main point is to follow the basic principles of eating that are common to all Asian countries. Primarily this involves a diet based on grains and lightly cooked vegetables along with smaller amounts of other foods. If you put food in your stomach that is cold and raw your body needs to heat it up. This draws on your energy and slows your metabolism. When we cook outside the body this lightens the load on the digestive system and increases the bioavailability of nutrients. You should eat a variety of vegetables, preferably at every meal, locally grown and organic. Fruits are also beneficial but are not as valuable as vegetables and should only be consumed in moderation. According to Chinese tradition vegetarian diets are inadvisable because can lead to a long-term deficiency. However, an excessive consumption of meat, as is common in American cuisine, should be avoided. Dairy is not a part of the Asian Diet because it produces “phlegm” in the body. Dairy can manifest as sinus congestion, brain fog, tumors and skin conditions. Even though dairy contains calcium, this is overwhelmed by the protein casein, which actually draws calcium from the bones. It is much better to obtain calcium by eating green vegetables on a daily basis. Green tea stimulates the nervous system, promotes fat-burning and improves bone density. You should consume at least one cup of green tea per day. Chinese medicine is a holistic way of looking at health emphasizing how mental and emotional factors interact with the physical body. It is important to foster a positive attitude and create balance in your lifestyle in order to achieve optimal health. White rice, soba noodles, oatmeal, quinoa, bok choy, broccoli, carrots, onions, mushrooms, zucchini, cauliflower, asparagus, water chestnuts, corn, potato, beef, salmon, chicken, eggs, tofu, soy milk, almonds, walnuts, peanuts, nori, miso, mayonnaise, sesame oil, soy sauce, green tea. You should get some exercise every day but it is important to maintain balance and not be continually active. Take time to rest and recharge and get enough sleep. Tai Chi is particularly recommended as the ideal form of exercise. 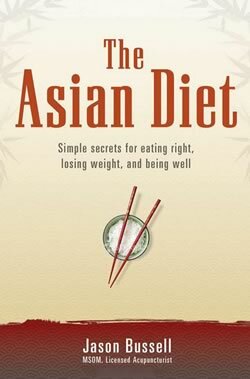 The Asian Diet: Simple Secrets for Eating Right, Losing Weight, and Being Well retails at $14.95. Encourages a balanced intake of a variety of healthy foods. Advocates a high consumption of vegetables. Addresses the importance of a positive attitude for balanced health. Includes a section highlighting the health effects of different foods. Recommends consumption of white rice, which is regarded as a processed, high-glycemic carbohydrate. Discourages the consumption of fresh salads and fruit. Only includes a couple of recipes. Will not appeal to vegetarians. Some of the author’s “facts” are questionable, such as The Chinese consume 40% more calories than Americans. The Asian Diet encourages us to eat and live in accordance with the principles of balance and moderation. Consuming the right proportions of nutritious foods and living a healthy lifestyle will have positive effects on your body weight and wellbeing. This would be a lot more funny if you learned how to spell, and weren’t as racist.